Happy Quilting: They're Finished!! I'm Celebrating with a Giveaway!! They're Finished!! I'm Celebrating with a Giveaway!! I have been procrastinating making my class samples for a while now. The specific class ones weren't to bad, but the basic ones, I just had a hard time getting excited about making them. But, now that they are done, I am so excited!! I got the idea at Market to display them on foam board, don't they just look so awesome!! These will be my go to samples for the standard quilt "building blocks". There are flying geese, half square triangles, goose in the corner, and lattice blocks. Yippee Skippee!!! You can find all the latest and greatest at Southern Fabric. Check out these great new lines that just came in. Happy Go Lucky by Bonnie and Camille. You'll find it in both yardage and precuts! Flats by Angela Yosten, they even have the adorable Doll and Clothing panels!! And you can always find great sale fabrics, including the memorial day sale fabrics that are marked 20% and 30% off yardage and precuts! It's a great time to get some fav's before their no longer available to get. Maybe some of this . . . So . 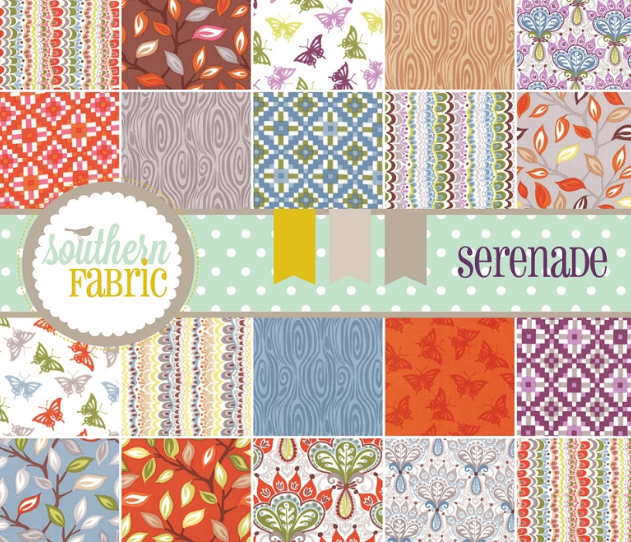 . . how about a chance to win some some free fabric from Southern Fabric?? 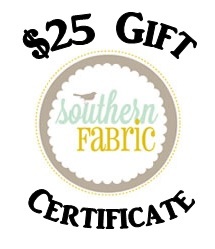 Aubrey is sponsoring a $25.00 Gift Certificate to one lucky reader!! That's it. Up to 2 entries per person. Giveaway will close on It will close on Tuesday, June 4th and a winner will be selected randomly and announced shortly after. I would love some Noteworthy by Sweetwater. I'm really starting to love fabric with small text printed on it. And love your blog. It's one of my "go to's" every morning. I would love a lot of things, lol. She has a really nice selection of patterns and fabrics. I do have a few christmas patterns that I will be making this year, so Icicle Kisses would be a nice fabric line to get for one of them. Oh, I just love the Serenade - I could go with a bolt of all of it, but would settle for a bundle. I would buy some solids or dots. I need backings for bibs and fabric for toy blocks. I love the new Flats collection! Thanks for the giveaway! I subscribed to Southern Fabric's newletter. Where do I start? Looking at their website Heirloom did jump out at me. I would buy something from the Shades of Black collection. Love your samples - so clear and helpful! I love Southern Fabric! They are so good to me down here in Australia. I've always liked Salt Air and not bought it so maybe that's what I'd buy. I am suscribed to the newsletter - thanks for the great giveaway! I'd spend it on charm packs (they're such a treat!). Aspen Frost, In from the Cold, and Winter's lane- maybe then I'd get a head start on Christmas stuff! I might actually buy some clothing patterns, I saw a cute skirt pattern. Happy Go Lucky would be lovely! She carries one of my favorite designers - Sweetwater - so I'd spend my money there. About to start a quilt using Noteworthy. Thanks to sponsors who offer giveaways!! I would like to get some charm packs, ad I'm really loving the colors in Aspen Frost! I would love the serenade. I love your sample boards they will be very useful for your teaching. And I just signed up for the newsletter. hmm...some aviary lilac is beautiful!!! I am in need of some bright and sunny fabrics for my stash. With another Texas summer on the way, I need some inspiration! So far I like Ticklish and Coquette. Your samples look great :) I would love some Happy Go Lucky Hop in Navy or maybe scrap bags! Thanks for the chance to win! I would put the money toward some pre-cuts. I started a scrappy flip and sew quilt, however I already donated all my scraps to a local center for the needy. Now I need to go out and buy scraps! What was I thinking?? thanks for the chance to win. I would love to get my hands on some chevron fabric. Congratulations on your finish and thanks for the giveaway! I would love to put it towards Gypsy Caravan - Fat Quarter Bundle by Amy Butler, ty so much for the chance! I can't decide what I want. A little of everything? Oh my! I would like to look & look & look! Then I would probably pick something to make for myself. I love the per-cuts! Subscribed to Southern Fabric by email. I would buy a little yardage to finish up the border on a quilt for my bed! She has some great scrap bags. I'd but a couple of those. Thanks! Oooh! Noteworthy by Sweetwater! I just love Sweetwater's lines of fabric! Doesn't it feel great to complete a project? I have subscribed to Southern Fabric's newsletter. I would love Happy Go Lucky by Bonnie and Camille, love their fabrics..your idea is great for your block display..inspires and encourages.. I would love some happy go lucky, or really anything Bonnie and Camille! I also subscribed to Southern Fabric by Email. Thanks for the nice giveaway! I follow on FB, so that gives me another little chance, I'm feeling lucky!!! I'm in desperate need of some throw pillows, and the moda honey honey line would be perfect. Oh Happy Go Lucky for sure!!! Thanks for the giveaway! oops I didn't realize it was supposed to be two separate comments...here's my second one saying I subscribed to the newsletter! I also subscribed to their newsletter! Thanks! I'd like to try my first quilt! I recently bought the Fireworks pattern from Camille and would love to use Happy Go Lucky! I subscribed. Thanks to you both! I have several quilts in mind, so it depends on which one goes to the top of the list based on whim of the moment and then I'll decide what fabric I would buy. Thanks for the chance to win! I would probably save it for one of the new fabric lines coming out this fall - Joel Dewberry's new line maybe. I would use my $25 on any sale item...so it goes farther! Thank you! I am subscribed to their newsletter. Salt Air, WOuld love to make a quilt with it. Thanks for the chance to win. I love all the blues in Spa! I would buy some yardage - maybe Oink A Doodle Moo because I plan to make a cow quilt. I love Lark, by Amy Butler and it's on sale too!! I would put the $25 towards Happy go Lucky. Bonnie and Camille are my favorite designers ! I would really like to have some of the Happy Go Lucky. I love Southern Fabrics, great selections! 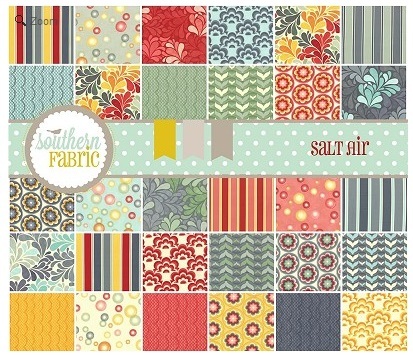 'Salt Air' and 'Serenade' have patterns that lend themselves to EPP my latest craze. I do like the Happy go lucky and Salt air, so perhaps that would be in my cart if I win! I now subscribe to the Southern Fabric's newsletter! I receive Southern Fabric's newsletter. I am loving the red and white chevron..patriotic and fresh! I'd buy some white fabric (boring, I know). I would buy charm packs and/or scrap bags; I need them for my EPP hexagon project! I receive the newsletter; thanks for the chance! I would get some happy go lucky. I would buy some of the Riley Chevron prints. I am LOVING that Salt Air! Goodness that would be so pretty in a quilt! I love Happy Go Lucky. There's one on the bottom row that just takes my breath away.!! I would buy Seranade! Love the colours and patterns! I am loving Salt Air by Cosmo Cricket but could also replenish my Happy Go Lucky stash! I can't get enough! I also subscribed to the newsletter! I really like the Happy Go Lucky line! I would get some Cuzco. I've wanted that forever, I need to get it before it goes away! I love the Happy Go Lucky fabrics. Thank you for the chance to win some. Glamping, Glamping, and more Glamping. Love this line! And now I'm a subscriber to the newsletter! I won't get to the beach, so if I win, I would order some salt air! I am in love with the happy go lucky fabric! 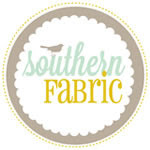 I have also subscribed to Southern Fabric's newsletter! I love Simply Color. I have some already, but a few more sure wouldn't hurt? Right??? I signed up for the Southern Fabric newsletter! They have so much to choose from! I'd probably go with Happy Go Lucky, because it's just so darn cute. I would love to have some PB & J. I think that is a great collection. I subscribe to their newsletter. What a nice shop! I think I would use it for some Soul Blossom peony fabric. Great giveaway! 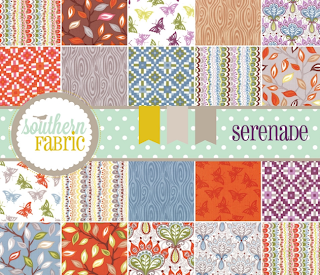 If I win I would get the serenade collection fabrics! Too many cute fabric selections to choose from! I would love to make something from Aviary Vintage Yellow, I love the black, yellow and gray combination. Subscribed - my toddler is moving into a big girl bed and I will use it for fabric for her new quilt. Ohhh so many pretty things to choose from, but I know I would pick salt air, because I love it so much!!!! I subscribed to the newsletter. I would love to win! Today I want Happy go lucky but tomorrow I'm sure it would be something else. Thanks for the chance. I would buy some Happy Go Lucky yardage!! I would buy some Flats! I like Flats by Angela Yosten. I really like that "Flats" fabric line; would make a wonderful picnic blanket quilt. I'd have to snag some of the Amy Butler fabric I found in the sale section! Her designs would make an excellent backing for the quilt I'm working on. I'm signing up for the newsletter right now! I would get an Amy Butler jelly roll! I subscribed to the newsletter. Thanks! oh so many wonderful choices, I would probably go with some yardage from the Marmalade line to make a dress for my little girl that will be coming any day now. Buy some Happy Go Lucky, of course!!! I think I'd have to get some Happy Go Lucky, it's got such a happy feeling to it. I'm really loving Heather Bailey fabric, that's probably what I would use the gift card on. And I subscribed! 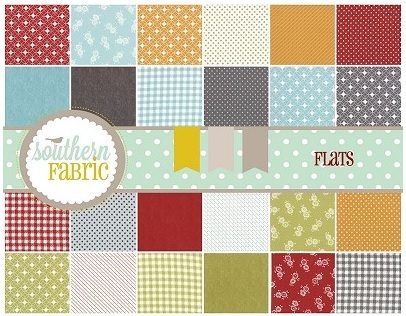 And ANOTHER way I would spend that lovely $25 gift certificate from Southern Fabrics is to buy the Flats paper dolls! I would love the flats, so cute. I would love to get some yardage pieces from the Noteworthy collection. I have subscribed to the newsletter. I subscribed to the Southern Fabrics newsletter. They have such a great selection of patterns at Southern Fabrics - I would probably find a pattern and a piece of fabric to make it. Kumari garden Jelly Roll, Pink please! I would love to make some stuffies for my girls out of that, Scrappy stuffies, yes! I am in desperate need of some Happy Go Lucky, and a gift certificate would be just the thing to help me out! I, too, receive the newsletter from Southern Fabrics. I would buy Amy Butler's Tumble Rose and Sun Spots. I would definitely have to get some Happy Go Lucky! I have a mini charm pack and I need some more!! I would add to my Happy Go Lucky collection that I haven't cut into yet! ha! I receive the newsletter from Southern Fabrics. I'd apply it towards a half-yard bundle of Salt Air -- and then start the next quilt! I'd love to win $25 to buy fresh new fabric for some baby quilts! I would love to get some Noteworthy!! Thanks! I would put the certificate toward a half yard bundle of Simply Color! Thank you for the chance! I would probably use it towards the scallops in the Happy-Go-Lucky Line! Love them! I am already subscribed to their newsletter! Thanks! I would buy some Flats! I am in love with those prints. I joined the newsletter mailing list! I'd get some Salt Air for a picnic quilt! I would get something bright and fun! I get the SF newsletter! I would Oink A Doodle Moo - Cow Hide - Black on Eggshell to make some jessie pants for my daughter! Would be sooo cute!! 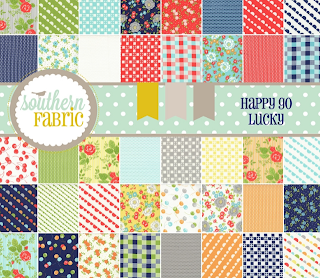 I am now convinced that I need the Happy Go Lucky Fat Quarter bundle! I love the scallops and vibrant summer colors! I would use the monies to buy pieces to complete the colors needed for a project that I have in mind to start - no single line, just some really good blenders. Fabric of course! I am so in love with so much fabric right now. I'm always looking for some fun fabric to make baby quilts! If I won, I'd pick up some Happy go Lucky yardage, I have precuts and a fqb on the way and I will need yardage to supplement! I think I'd have to go with the bundle by Lucie Summers ~ Summerville Spring! Love her designs. Thanks for the giveaway ~ so generous! I'd like some of the fabrics from Vintage Modern. I've been wanting to use those colors for a quilt. I think I would get something from the Ticklish line - I love those bright, summery colors! I subscribed to the Southern Fabrics newsletter. Thanks! ALREADY SUBSCRIBED TO SF NEWSLETTER VIA YAHOO MAIL. HI! THANKS FOR A SWEET GIVEAWAY! I THINK I'D PURCHASE SOME "TICKLISH"! Thanks for the giveaway! I'd definitely get some MORE of HappyGoLucky! I subscribe to SF newsletter already. Love them! I would get an In From the Cold layer cake! Thanks for the chance to win. I would love to get some yardage from Happy Go Lucky! I subscribed to the Southern Fabric newsletter. Maybe a Snap Pop or Serenade layer cake!